Your site scored very well and we are pleased to present you our gold award. The gold award is received by less than 1 percent of all applicants. Thank you from the Internet community for a job well done. I am happy to recommend your great work. Congratulations! 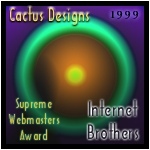 Your site has recently been reviewed by our design team and we would like to present you with this award! While reviewing your site we were overwhelmed by the content as well as graphic selection by the web master. The Cactus Designs Team thanks you for giving us the opportunity to browse your home, our visit was most useful. You provide excellent information which would help many webmasters. We will be honoured to include your site on our winners page. Your site shows many brave steps in the browser compatibility war and we feel that your site has a leading edge in this type of web experience. Please continue to add your excellent content to the web. The Elite Site Design award is only given out to the sites I consider the best. These sites are well designed, look nice, and have a reasonably good content matter. My wife thinks I'm too nosy. At least that's what she scribbles in her diary.